Or is laundry a bunch of spiteful beasts? Those socks are taunting me. Hee hee. We got separated so she couldn’t pair us up. It’s the same clothes every week. Despite the variety in the kids’ closets. Oh, pick me, pick me. You wore me just yesterday, but no one will remember. The clean clothes mix with the dirty. Let’s go for a swim, boys. She’ll never know we didn’t need to be washed again. When I get tired of washing clean clothes, I start smelling them. I smell something that looks clean and…phew! Okay, that’s there for a reason. Made you smell us. Made you smell us. Laundry – how many of you hate it? What I love is having all the clothes hung in the closets and folded in the drawers. I love seeing a stack of fresh towels in the bathroom. I seriously love sliding into cool, clean-smelling sheets at night. But I never win the battle of having it all done at once. Because laundry is this cycle that never ends. But this post isn’t about the fight with laundry. It’s about the fight with myself. More than laundry, I hate my bad habit of raising my voice in anger. And it’s a vicious cycle. It goes from me…to kids yelling back…to kids yelling at each other. A game of loud dominos. Why can’t you just stop yelling? You are not being a good mom right now. When are you going to fix this already? I visit with friends and see endless patience. I watch the helpers in Sunday school and cannot fathom a harsh word ever escaping them. These moms can’t possibly lose their patience like I do. Their buttons either aren’t being pushed, or they have an ultimate control pad over those buttons with a seventeen-digit letter-number-symbol password the kids can’t crack. Despite my very active imagination, I can’t picture any of them with angry faces and loud voices. I feel like I’m on the spin cycle. Except I’m not getting rid of this horrible smell. This horrible feeling. This horrible habit. So I just keep spinning. Wash. Rinse. Repeat. When does my fluffy, fresh-scented Mom-ness get folded and put away for good? I tell myself every day, Just love them. Show compassion. Use tenderness. Even when they disobey. Even when they speak hurtfully. Even when they start to yell. Share your understanding before the lesson. Without frustration. I understand your brother annoys you. That’s normal. But if you want him to treat you well, then you need to treat him well. Before getting mad about him taking your toy and yanking it from his hand, ask him to please give it back. Would you want it yanked out of your hand, or for him to ask for it nicely? Love is the root I want behind every interaction. But there have been so many days where my lost temper is like a spot on a lovely white shirt. And despite the rest of the shirt being beautifully white and clean (and full of love), that spot stands out from the rest. Sometimes I wonder if there’s even a stain remover strong enough to eliminate it. 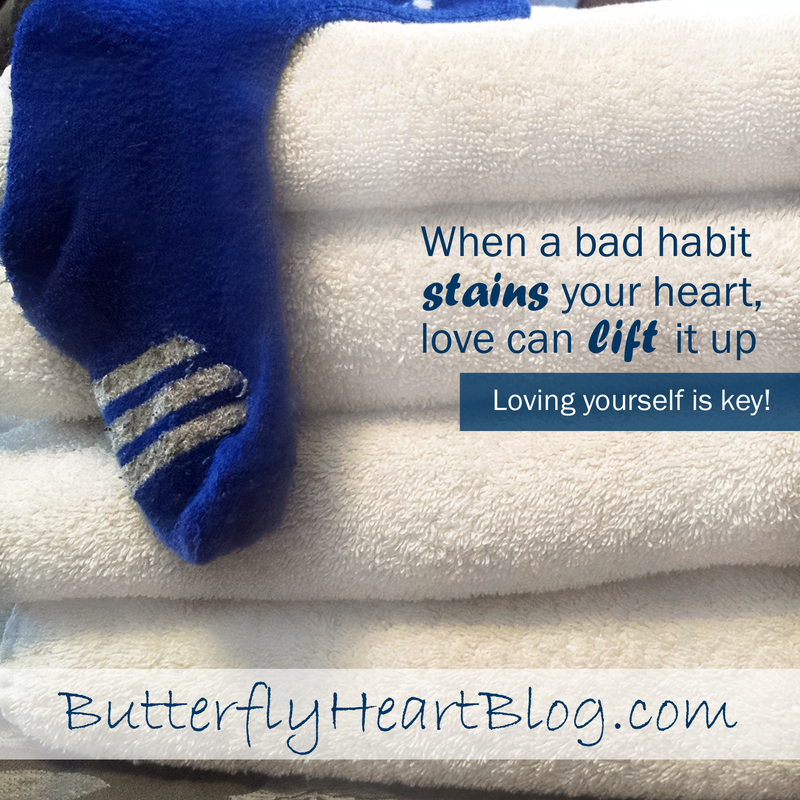 Yes, love can lift up that stain as it lifts me up. Some days I do feel it lifting me up. Other days I slide right back down into the hole I’m in. With all of my own harsh judgement, I’ve forgotten something. Love can’t penetrate that stain if I’ve forgotten to soak in it. If I keep tearing myself down, how will love be able to lift me out of the hole I’m in? I have no answers for this one, except to keep trying. To not berate myself as I go. Is it hard? Yes. I won’t lie. I cry on those bad days. I feel like a failure. I have high expectations of myself. I want my calm, patient Mom-ness to be there every minute of the day, and I am impatient with her tardiness. I never expected this angry mom to show up in the first place. Who invited her anyway? Is it ever this hard for you?